The Maple Avenue Residences in New Rochelle are located in the exclusive enclave of Residence Park. This exquisite residential development is designed by well-known Architect William Alicea and features expansive panoramic views near the center of town. It is not often that a new residential development of this quality and character comes on the market. Maple Avenue holds the distinction of being located in one of the first residential parks and garden city communities in the United States. Gracing an acre of land on the former country estate of the wealthy 19th century New York City hotelier Simeon Leland, this is a once-in-a-lifetime opportunity to own a residence that offers a rare combination of a private park, convenient living, contemporary elegance, and modern amenities. Homebuyers of The Maple Avenue Residences in New Rochelle can experience a distinctively unique lifestyle. The New Maple Avenue Residences will have a splendid collection of incredible features. World-class comforts are abundant in every facet, in a home that offers the best of everything. From the high ceilings and ample indoor & outdoor space, to the custom designed features, every detail has been well thought- out and crafted for excellence. Supreme comfort, convenience and craftsmanship make The Maple Avenue Residences the perfect place to enjoy a healthy living environment that provides residents and their families with everyday privacy and enjoyment. The Maple Avenue Residences will each have 4 bedrooms and 3 baths with 9-foot ceilings or 3 bedrooms and an office space with a separate entrance along with 9-foot ceilings. Additionally, each unit will have a greenhouse right off of the kitchen for spices, a butler pantry, an office for private study, and a laundry room with top of the line GE washer and dryer appliances. Each Residence will also have a private entrance way and feature a large porch to relax on, a large master suite with a make-up room, walk-in custom designed closets, a large master bath with a Kohler shower faucet with rain shower head. There are two additional bedrooms, both with private balconies. All bedrooms will feature modern contemporary finishes using a wall mount double sink vanity and anti-fog led lighted mirrors. A meticulously maintained private park and green space for family privacy and grand- scale entertaining will also be included in each residence ownership agreement. Each residence has a heated expansive private 2-car garage. The Maple Avenue Residences will quite possibly be the finest residential property development in this historic community. If you are new homeowners, busy professionals or even empty nesters who are seeking the urban lifestyle in a suburban environment setting, The Maple Avenue Residences is for you. You will enjoy walking the streets around The Maple Avenue Residences. As you walk around, you will see classic Romanesque, Colonial Revival, Neo-Classical Revival, and Art Deco architecture. Walking a few blocks further, you arrive into the Downtown District of New Rochelle, only a few blocks away from the Long Island Sound. The beautiful location provides some units with panoramic views from your residence. The Maple Avenue Residences are also close to houses of worship, excellent schools, the distinguished Montefiore Sound Shore Medical Center, and the highly regarded College of New Rochelle. 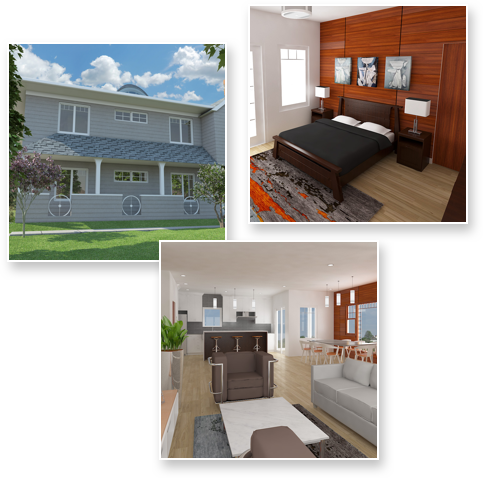 The Maple Avenue Residences are located on a beautiful tree-lined area in southeastern Westchester County, less than three blocks away from the Long Island Sound that has access to public and private marinas. Further, The Maple Avenue Residences have easy access to public transportation and/or freeways. Within a few minutes drive to the New England Thruway (I-95), Metro-North and Amtrak, The Maple Avenue Residences is conveniently located near outlets for travel throughout the tri-state area. Manhattan is only thirty minutes away by Metro-North Railroad. Amtrak’s Northeast corridor service connects Downtown to Washington DC, Boston and points in between. Limousine service is also available to the two New York Metropolitan area airport. Residents are steps away from The College of New Rochelle, which is ranked by U.S. News and World Report in the Top Tier among regional colleges and universities in the Northeast for 2015. The College of New Rochelle offers many educational, cultural, and personal growth enrichment experiences for residents that live in the surrounding community. The Maple Avenue Residences are in close proximity to the New Rochelle Downtown District, which offers an array of family-owned and operated businesses. Downtown New Rochelle is an enjoyable and comfortable place to shop and dine. Whether it’s a quick pizza, taco sandwich or elegant leisurely dining experience you crave, it’s available in Downtown New Rochelle. Some establishments even offer entertainment on weekends. Living at the Residences on Maple Avenue puts you at the center of a dynamic and unique community, which is close to the pulse of city life, yet has a personality of its own. Inside The Maple Avenue Residences, you will discover your own private residence with soaring 9-foot ceilings topped by custom home features all with private balconies and entrances. Every amenity is designed to complement your success and meet the desires that fulfill the Westchester luxury lifestyle you crave. WESTCHESTER, N.Y., July 10, 2018 /PRNewswire/ -- Local developer D'Wayne Prieto of Ward Capital Management, LLC delivers a new housing concept which he calls "CoHaus", a large single-family flat residence that combines maintenance free living while owning your home. The Condominium Haus lifestyle is for those who are eager and delighted to leave house maintenance to others while seeking either more space for their growing family or to downsize from a larger home. The Maple Avenue Residences, located at 63-77 Maple Avenue, is in the downtown area of the City of New Rochelle and features 6 condominium residences in a park setting. Residences range in size from 2,307-2,414 square feet of living space and include: individual balconies, private garages and storage rooms. Each CoHaus residence features approximately 3,000 square feet exclusive "in-house" space with its own private driveway and a rear yard that is maintained by the condo association. These CoHaus units are listed for sale with Lisa Sangster & Iliana Fleischman from Julia B Fee International Realty starting at $990,000 going up to $1,200,000. Based in Dobbs Ferry, New York, Ward Capital Management, LLC is a Real Estate Investment and Development firm focused on Multifamily Residential, Retail, and Hotel Assets. Ward is a full- service real estate firm providing a broad range of principal investment, development, advisory and investment banking services. The firm bridges the gap of investment opportunities between Main Street and Wall Street. Ward specializes in challenging projects; extracting value from unique investments in order to maximize investor returns. Their insightful, well-founded strategies are backed by years of experience and quality data. Ward is not conflicted or limited as a broker, operator or banker— but equally comfortable with real estate financing markets and real estate operations. For decades, Westchester County’s cities seemed stuck in a peculiar limbo, too sleepy to be New York, too gritty to be suburban. But as a housing crunch continues to grip neighborhoods in Manhattan and Brooklyn, some midsize cities just north of New York are pushing to take advantage. In a flurry of activity, developers are adding apartments, stores, restaurants, theaters and even a brewery to Mount Vernon, New Rochelle and Yonkers, where local leaders are embracing aggressive growth policies. Home to around 80,000 residents across its 13.2 square miles, New Rochelle has nine miles of coastline and a variety of parks and nature reserves. Its established neighborhoods include sprawling residential areas in the middle and northern sections and more densely packed single- and two-family homes in the south. Zoning was recently approved to continue the creation of a mixed-use downtown district that will include 5,500 apartments, hundreds of which will be designated as affordable housing. In 2014, New Rochelle was voted the 13th best city to live in the United States, out of 550 cities, and was the only city in Westchester County on the list according to 24/7 Wall St.
Americans are leaving the costliest metro areas for more affordable parts of the country at a faster rate than they are being replaced, according to an analysis of census data, reflecting the impact of housing costs on domestic migration patterns. Those mostly likely to move from expensive to inexpensive metro areas were at the lower end of the income scale, under the age of 40 and without a bachelor’s degree, the analysis by home-tracker Trulia found. Looking at census migration patterns across the U.S. from 2010 to 2014, Trulia analyzed movement between the 10 most expensive metro areas—including all of coastal California, New York City and Miami—and the next 90 priciest metro areas, based on the percentage of income needed to pay a monthly mortgage on a typical home. The net population flows skewed away from the most expensive markets, though the trend became less pronounced for those higher up the income scale. For example, there was a net flow of more than 27,000 people making less than $30,000 from high- cost markets to more affordable markets throughout those five years, but for those making more than $100,000, the net loss declined to 2,438 people. The census data don’t specify why a person moves, said Ralph McLaughlin, Trulia’s chief economist, but the disproportionate impact on lower-income people suggests housing costs are a pressure point. “All theories suggest that when a market becomes increasingly unaffordable, those that bear the burden are those on the lower end of the income distribution,” he said. The data look exclusively at movement among people within the U.S., not international migrants. Other recent research has shown a similar trend of migration from expensive markets to inexpensive ones. The Ward Capital Management Team is led by D’Wayne Prieto, who provides an entrepreneurial focus and commitment to serving his investors, customers, employees and community. The Ward Capital Management team has played lead roles in significant real estate transactions in diverse markets around the world. The leadership and real estate expertise of the team allows Ward Capital Management to excel in all aspects of developing, financing, acquiring, and operating real estate assets, portfolios and enterprises. The sales team at The Maple Avenue Residences is a unique collective of seasoned, motivated, and successful agents backed by a cutting edge brokerage with a broad reach in the local market, New York City and the world beyond. They have successfully leased up and sold out other new development projects in Westchester, giving them a proven track record in this area of real estate. Lisa & Iliana not only sell in the downtown, they are ingrained in New Rochelle. From being residents and property owners here, to patrons of the local businesses, to being involved with local organizations; they LIVE, WORK & BREATHE this community every day. Their children attend the local schools here and participate in extracurricular activities, even summer camp. They can tell you the best place for baklava bread pudding or brick oven pizza. They can also share the best park to fly a kite or the best place for a romantic date night. They truly love living in this amazing place called New Rochelle and would love to share all that it has to offer. Their intimate knowledge of Downtown New Rochelle means they can speak to the unique lifestyle and offerings of the area; including the diverse dining options, entertainment, arts, proximity to waterfront parks, access to public transportation and real estate. Most importantly, their knowledge of the local market and real estate expertise will ensure your real estate transaction is carried out professionally and smoothly. Your Maple Avenue Residence will allow you easy access to yacht, sailing and rowing clubs which dot the coast on Long Island Sound, and beach clubs, which line the shores of Davenport Neck. Beckwithe Point, The Greentree Country Club and The Surf Club are the largest of the private shore clubs, providing waterfront recreation to members during the summer season. The New York Athletic Club sits on Travers Island, located on the border of New Rochelle and Pelham Manor. If you are a fan of sailing, Castaways Yacht Club, Echo Bay Yacht Club and Huguenot Yacht Club are three well-known, private yacht clubs in the city. New York Sailing School and New Rochelle Rowing Club each have histories dating back over 100 years. The City also operates a large marina with 300 slips and 150 mooring spaces. As a resident of Maple Avenue, you don’t need to drive out of town to get in touch with nature. Whether you have 20 minutes or 2 hours, you will enjoy exploring the impressive collection of parklands and nature preserves, with 102 acres of inland waters, 231 acres of public parklands and 168 acres of park lets. Glen Island Park is a 105-acre island property connected to the mainland by a drawbridge that was built in the 1920s. Not only does Glen Island serve as a park, but residence’s may also swim at the beach that is part of the Long Island Sound. Five Islands Park is a group of islands that are connected by footbridges and walkways, offering playgrounds, sports, hiking and camping facilities all that you can enjoy as a Maple Avenue Resident. Hudson Park a former military base after the civil war and now a protected tidal and fresh water wetlands preserve is located along the city's harbor front and includes a beach for residents. Additionally, Hudson Park serves as a United Coast Guard Naval Station a city boathouse, and is used by several yacht and rowing clubs. Ward Acres is made up of 62 acres located in the North End of New Rochelle and provides a combination of unspoiled forest preserves, and historic horse stables/cemeteries. The landscape offers an extensive trail network that gives hikers good exposure to the park. Twin Lakes Park is 220 acres of land reserve along the Hutchinson River in New Rochelle’s Northend. The many foot trails serves as the spine for a more extensive trail network in the area, the vast network surrounded by two large lakes is open to equestrians and mountain bikers, making it an especially popular destination. How about some golf, The Wykagyl Country Club is located in the Wykagyl section of New Rochelle on North Avenue just south of Quaker Ridge Road. Golfweek magazine ranks Wykagyl as one of America's Top 100 Classic Courses. Pelham Country Club straddles the border of New Rochelle and Pelham Manor. The course is a mile from the Westchester-New York City border and Pelham Bay Park. Further, you are very close to two of the top public golf courses in the country. The 36 hole Pelham Bay and Split Rock Golf Courses were Named the #1 Golf Courses in New York City by PGA.com. If you enjoy playing tennis, New Rochelle Tennis Club located in Wykagyl is one of the oldest lawn-tennis organizations in the country. Living in a good school district doesn’t just bring better teachers, better books, and better test scores — it also can help preserve home values and ensure faster resale rates. For Maple Avenue Residences interested in public school education, the City School District of New Rochelle operates a public high school, two junior high schools and ten elementary schools. On seven separate occasions, the City's schools have received the prestigious Blue Ribbon Award from the U.S. Department of Education. New Rochelle High School is one of the most diverse high schools in the country; the student body represents over 60 different countries from around the world. The school offers over 240 courses including honors, research and advanced placement courses. The New Rochelle Public Library System is part of the countywide Westchester Library System. Hudson Montessori is a private Montessori school in Wykagyl serving pre-kindergarten level through fifth grade. Iona Grammar is an all-boys Catholic grammar school on Stratton Road serving grades one through eight (subsumed into Iona Preparatory School). Iona Preparatory School is an all-boys Catholic schoolserving grades kindergarten through 12. Mount Tom Day School provides private day school serving pre-k level through second grade. The school is housed in the mansion of renowned 20th-century American artist and illustrator J.C. Leyendecker. The school bordered New Rochelle Academy, a prep school (N-12) that closed down in 1987. The Thornton Donovan School is a co-ed preparatory school in Beechmont. The Ursuline School is an all-girls Catholic school in Wykagyl serving grades six through 12. The College of New Rochelle – The largest women's Catholic college in the United States, founded by the sisters of the Ursuline Order. Iona College – Catholic college founded by the Congregation of Christian Brothers. Monroe College – provides professional, career oriented and business centered education. Get exclusive updates and pricing information by registering. 2019 The Maple Avenue Residences. All Rights Reserved.